The MMDA reported a high of 30 road crashes occurring in Metro Manila. These happened during a very wet day with heavy rains brought about by a typhoon approaching Luzon. Among the high profile crashes yesterday were one involving a bus that fell from the Skyway that cost the lives of 3 people including the driver of the bus. The other involved multiple vehicles including buses (again) and several private vehicles along the underpass section of EDSA near Ayala Avenue in Makati City. In both cases, those involved and those investigating the incidents all cited the wet and slippery road as the probably cause of the crashes. The statements were all too familiar with drivers stating that they didn’t have enough time and space to stop because of the slippery road. Such reasoning only indicates that there is the likelihood that these drivers did not apply safe driving practices to keep their distance from vehicles ahead of them and to regulate their speeds given that wet roads offer less friction or resistance that would allow for shorter braking distances. Despite denials, it is likely that the bus that plunged from the Skyway was speeding and that the driver lost control of the vehicle. I would like to believe that the barriers of the elevated highway were designed according to standards set by the DPWH, which are based on international standards that are incorporated in their safe design manual. Despite the standard design for the barriers, the bus still managed to penetrate it, apparently elevating once it hit the barrier. 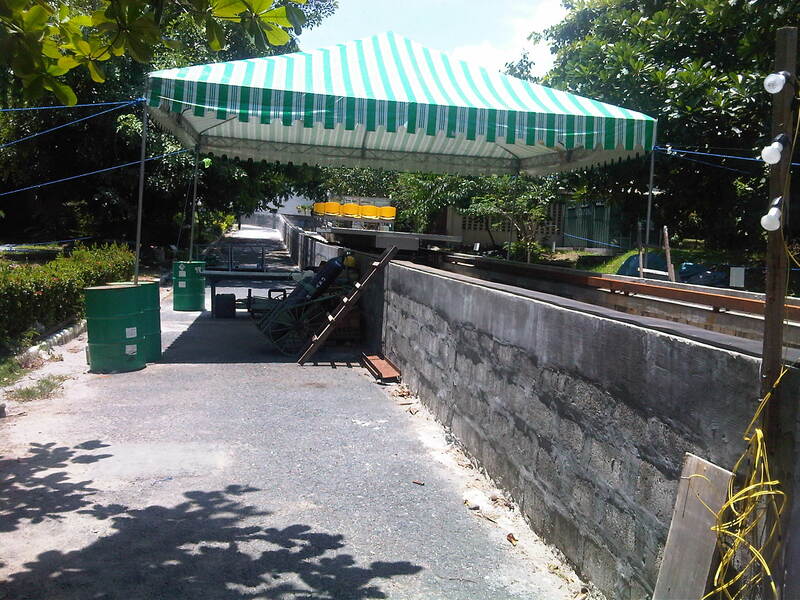 Barriers are designed according to certain test levels that are deemed suitable for the specific facility. Such test levels that need to be satisfied incorporate elements like vehicle mass, speed, angle of impact and height of center of gravity of the vehicle (Reference: DPWH Highway Safety Design Standards, Part 1: Road Safety Design Manual, 2004). Since traffic along the Skyway consists of a significant number of heavy vehicles including trucks and buses, then the barriers should satisfy the test levels appropriate for these type of vehicles. Thus, it would be easy to check if the Skyway barrier design satisfies standards by checking the as-built specifications of the facility with the DPWH manual. Nevertheless, speeding and not keeping a safe distance between vehicles are typically causes that may be attributed to the driver. These lead to such road crashes being categorized under driver error as their cause, which is quite justified given that perhaps there are no problems pertaining to the infrastructure/road or the vehicles involved. The weather is not really to blame since it is beyond control but road conditions may deteriorate due to rains if, for example, road drainage is not properly designed or provided. In fact, hydroplaning may occur should there be significant amounts of water on a road and becomes a hazard when vehicles travel at speeds that effectively allow water to come between the tires and the pavement. In such cases, it is also necessary to check whether the tires are able to pump out water as the vehicle runs along the road. In fact, the ridges in tires are supposed to be designed to be able to pump out water, which is the basis for tires to be also checked to make sure that they are suitable for wet roads. Basically, all drivers should heed the message from a road sign that is provided along roads that are treacherous when the pavement is wet. “Slippery when wet” actually applies to all roads whether it be of Portland cement concrete or asphalt concrete surface, whether of good or bad condition. The mere presence of water on the road pavement presents hazards that can only be addressed if drivers practice safe driving. That is, to regulate their speeds, keep safe distances and lessen maneuvers regarded as risky even when roads are dry. A friend posted her disappointment over what she regularly observed through her condominium window overlooking EDSA Guadalupe. The traffic jams along EDSA seemed to be a 24-hour thing and she lamented about whether Metro Manila could solve this problem on congestion. She continues to be an active advocate for the environment and we have worked together on the electric jeepney that is now operating a 3rd route in the City of Makati and is also found operating elsewhere in other cities where its applications, to be fair, is still quite limited. My response to her is something I have also mentioned in other venues including previous posts on this blog and interviews granted to major media networks that have asked me what’s wrong about transport and traffic in our country. It’s really simple – we have failed to build the necessary infrastructure when they needed to be constructed. And we continue to NOT build the infrastructure that could have saved us much in terms of fuel costs alone and perhaps contributed much more to our economy, and definitely outweighing the costs that have often been cited as if it were a deterrent to the realization of a mass transit network for Metro Manila. Being one who has lived in both Tokyo and Singapore where they have good public transportation systems, I could not help but become excited when, returning from Japan before the turn of the century I came upon plans for Metro Manila’s rail network. I was excited because the decade before I was first exposed to similar plans for MM at a time when other capital cities in Southeast Asia like Bangkok, Jakarta and Kuala Lumpur where also planning for their own mass transit systems. In fact, they were also planning expressways in their respective metropolitan areas (i.e., Bangkok Metropolitan Area or BMA and Jakarta-Bogor-Depok-Tangerang-Bekasi or Jabodetabek/Greater Jakarta). Flash forward to the present, it is frustrating, if not depressing, to see that Bangkok and Jakarta were able to implement many of their plans that were critical for the growth of these metropolitan areas and definitely contributed to the overall sustainable development in those countries. Granted, Bangkok and Jakarta still experiences congestion like the legendary jams along urban highways in Bangkok. But which city around the world does not experience congestion? The key is to provide a viable and more efficient (also convenient and comfortable) alternative to taking one’s car. That should be in the form of a mass transport system that is comprehensive enough that it will allow for both mobility and accessibility to the traveler/commuter. The following figure from the 2005 World Transit Maps envisioned a network that is still now unrealized and, for the existing lines, have become the subject of controversy and other issues that include the absence of a single ticketing system similar to the smart and octopus cards found in other countries. 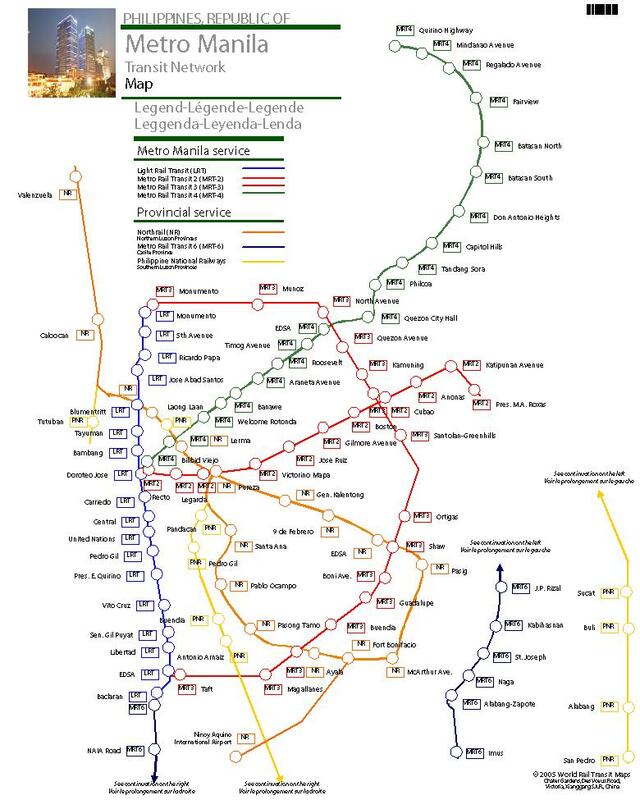 Can we imagine what could have been the experience of commuting in a Metro Manila where such a rail system would have been in place? My former students have related to me about how it was so convenient to move about in Singapore, Tokyo and Hongkong where the mass transit systems where comprehensive and integrated such that rail and bus systems could provide for the transport needs of commuters. I would like to believe that we have all the plans with us by this time and that the construction of transport infrastructure has long been delayed for our cities (not just Metro Manila but also other metros such as Cebu and Davao) so much so that we continue to suffer from the lack of critical systems that could definitely alleviate congestion and improve the plight of the general public. Perhaps people taking their cars and motorcycles will be convinced to shift to public transport if they see the benefits of doing so. For others who are still captives of our inefficient public transport systems, I am sure that the experience of having improved systems (and an expanded network) will be liberating considering their daily sacrifices just to make ends meet while losing much quality time, productive time stranded in traffic. I got my first look at the vehicle currently being developed by the DOST-MIRDC at the DOST complex in Bicutan. This was the same vehicle that was shown on some news programs a couple of days ago when there was some buzz about a MOA being signed between UP and DOST for the development of an automated guideway transit (AGT) prototype and test track at UP Diliman. The DOST Secretary was supposed to have said that it would cost somewhere between a fourth or a fifth of those developed elsewhere (read: other cities abroad) and that it would have a capacity of 60 passengers. The Secretary also was reported to have said that the AGT would eventually be travelling at 100 – 120 kilometers per hour! That’s quite fast for something that’s being packaged as an urban mass transit system. Together with the reports, both on TV and print (I haven’t heard anything from radio. ), were images of a transit vehicle used by DOST in publicizing the project. What appeared was an artist’s impression (or so it seems) of what looked more like a monorail than an AGT. But coming to Taguig for a meeting, I made it a point to ask our friends at DOST to give us a brief tour of the test track they constructed at the complex where the MIRDC with a little help from another agency involved in rail transit was testing a prototype vehicle that was shown on TV. I wasn’t able to catch those news reports so I was a little excited to see the vehicle being developed and by local engineers and scientists. Below are a few of photos of the vehicle together with the test track. I’m sure a lot of pundits out there were disappointed with what they saw after getting all the hype about the UP AGT. 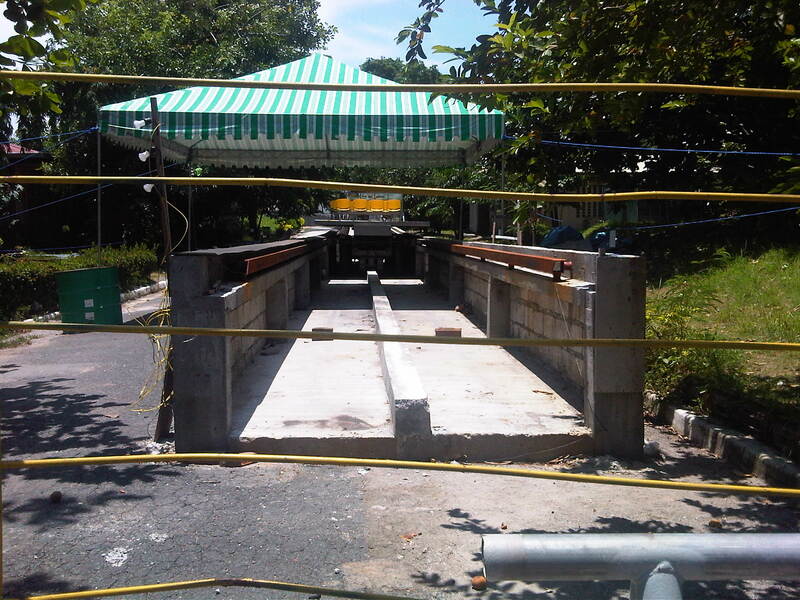 However, it turns out that this won’t even be what will run along the test track to be constructed at UP Diliman. Our friends at the DOST say that this was just a practice vehicle of sorts that DOST staff experimented on just to prove that we (Filipinos) are capable of developing a transit vehicle and the track that will carry it. 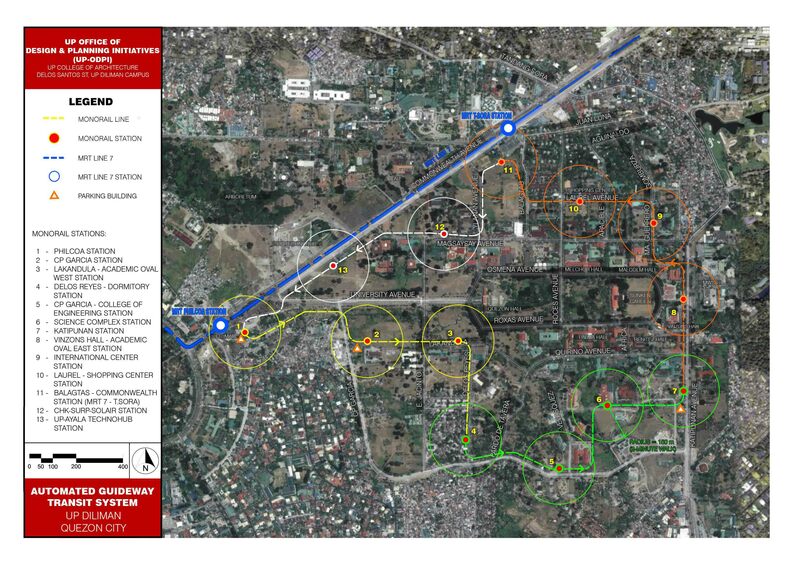 Of course, the future track and the proposed loop in UP Diliman will be overhead. Also, there will be other challenges pertaining to the superstructure (foundations, columns, girders, stations, etc.). Then there is the vehicle itself that should be safe and comfortable with designs adhering to ergonomic standards, an efficient motor and controller (it will be electric), and a suspension system that should give a smooth ride. Needless to say, the vehicle should also look good to be able to attract people and for it to be marketable. These are tremendous expectations indeed and it could really use all-out support from the government and maybe the private sector. I would not be talking about the funds and other resources required for this undertaking. Info on these are already available from the DOST and UP, and there are already initiatives to attract the private sector into having a look at the project and perhaps provide support in whatever way they can. I can’t help but be proud of what has been accomplished and what is still to come in as far as the project is concerned. I believe we should be eager to pitch in what we can in order to ensure the success of this collaboration between UP and DOST. Who would not want to be involved in a project where Filipino engineers and scientists will come together to come up with a product we can not only showcase as home-grown but something that would have a significant impact on public transportation in this country. Meanwhile, it would be better for DOST and UP to temper expectations so as not to put undue pressure on those who will be involved in the project. Pronouncements claiming that the system will replace the IKOT jeepneys are at this stage premature and only raises flags that would not be in the interest of the project. Claims, too, that the vehicle will run at 100 kph is unfounded and unnecessary considering, for one, that the average running speeds of such systems would be between 30 and 40 kph and probably top at 60 kph if there were sufficient distance between stations. I understand that the statements made were probably words of encouragement but I guess we have our work cut out before us and the challenges have been revealed on the way to the development of a home-grown AGT. The proposed UP transit system, whether it will be an AGT or a monorail, is a technology-driven project. As such, it can be argued that it does not need hard studies to establish the need for the system. Indeed, it is packaged as a prototype and one which, if implemented properly, will hopefully be a good example that can be deployed elsewhere where such a system is necessary. Such places may include CBDs like the rapidly emerging one in Bonifacio Global City or in small cities where there is a need for a more efficient form of mass transportation but could not afford the conventional MRTs or LRTs that have been constructed in Metro Manila. Also, a significant part of the initiative is the development of the vehicle, which is being undertaken by the DOST’s MIRDC. Their design and their production process should be replicable and they should have been able to bring down the costs according to the marching orders of their Secretary. After all, this system is being touted as something that would cost a fifth of a conventional system. The conventional way of planning, designing and building transit systems require a lot of studies including the so-called ridership studies that would establish the demand for the system. Of course, there are also considerations pertaining to the stations and analysis of the superstructure that will also cost something. It is no joke that the best examples of AGTs or monorails in other countries are priced so because of all the effort and expertise that went into their developments. We should not kid ourselves by claiming this will cost much less because we did not take into consideration just compensation to people who will be devoting their time and expertise to develop a “home-grown” version of what has been built in other cities. We shouldn’t also sacrifice the quality of the superstructure that includes the stations just because we want to reduce costs. We have to keep in mind that the infrastructure should be able to resist typhoons and the possibility of earthquakes. The foundations for the columns, in fact, should be designed well considering UP’s soil characteristics. On Wednesday I might just get my first look at the prototype vehicle when I visit the DOST for a meeting not quite related to the proposed transit system although it would be about customized vehicles. The vehicle that is the rolling stock for the proposed system is supposed to have already been built and being tested on a very limited basis at the DOST compound. Perhaps I can see for myself if it is something that will eventually be an impressive piece or something that will need much work once it is brought to UP. The signing of a Memorandum of Agreement (MOA) and groundbreaking for a proposed prototype transit system at the University of the Philippines Diliman campus is scheduled for the morning of July 18, 2011, Monday. The site will be at the open lot near the corner of Lakandula and Jacinto Streets just across from the College of Fine Arts and near UP Diliman’s Campus Maintenance Office (CMO). 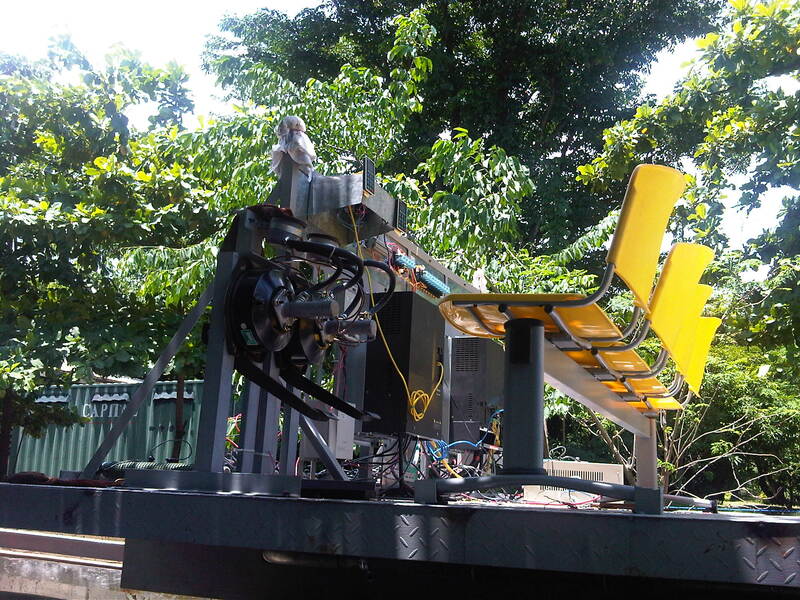 The prototype system is a pet project of the DOST Secretary and was originally billed as the system to replace the IKOT jeepneys of UP Diliman. It will be a major undertaking for the university considering that its expertise (i.e., faculty, staff and students) will be tapped to undertake the studies and designs for the system. It will be a multi-disciplinary project that would involve architects, engineers and planners as well as social scientists who will be assigned with the unenviable task of securing social acceptability of the project. The prototype system will have several phases in order to complete a loop. It is to be designed as a one-track, and therefore likely a one-way system. The “rolling stock” of modified buses each with a capacity of 60 passengers are supposed to have already been finished and are being tested at the DOST compound in Bicutan. It is still not known what the capacity of the system will be since there have been no studies to support demand (i.e., ridership), which will be affected by factors such as the route, direction and headways. among others. The project is one that is technology-driven rather than demand-driven. It is going to be an experimental system and one that will probably have to be tweaked from time to time given that it will be “home-grown” and attempting to reduce costs commonly associated with existing systems in other countries. Below is one of the proposed alignments for the system showing the initial phase from Philcoa (in yellow). The circles indicate the 2-minute walking distance radius although this is a crude concept considering people will be walking along the roads or sidewalks and not necessarily along a straight line leading to the proposed stations. Whether it will eventually replace the jeepneys is still up in the air but the stakes are high considering that a locally made AGT may be transferable or feasible in other settings. Perhaps areas such as Bonifacio Global City, the reclamation areas along Macapagal Boulevard and even the Batasan can have their own AGTs in the future. My only hesitation for the prototype at UP Diliman is that it is still unclear who will be shouldering the operations and maintenance costs of a system that is sure to have revenues that won’t be able to cover such. Then there is the issue of aesthetics that cannot really be addressed now considering most plans are still in the minds of the proponents and have not been transferred unto the drawing boards or computers. We hope to be able to answer these questions and answer them correctly and appropriately. Otherwise, our legacy for the campus would be a white elephant that nobody would have wanted in the first place. Whenever laws and regulations are crafted, one basic question that needs to be considered pertains to whether there is capacity to enforce such laws or regulations. This is quite logical and appeals to common sense since laws and regulations are practically prints on paper that will not have any impacts if not enforced properly and fairly. I mention “fairly” here because laws and regulation may also be the subject of abusive enforcement. That is, there have been cases where motorists are flagged down and charged with violations that are taken out of the context given the traffic conditions, and where the number of apprehensions are related to quotas set by authorities. Take the case of the unwarranted or illegal use of sirens (wangwang) in the past. There were laws and regulations for its use but for a long time these laws and regulations were not enforced properly, leading to the wangwang’s abuse by many unscrupulous people. Almost everyone have practically given up on this abuse of the siren when a newly elected President expressed his dismay and ordered the eradication of illegal sirens. Almost overnight, “wangwangs” were confiscated by authorities inspired by the Commander-in-Chief’s orders or removed by owners themselves for fear of the law bearing down on them. This was enforcement at its best. Unfortunately, it was not replicated for other traffic laws and regulations, wasting valuable momentum and the opportunity to make things right along our streets and highways. Quezon City’s Green Building Ordinance is quite good and well-meaning. It is very timely and relevant, and even includes provisions for upgrading transport in that city. Among others, it requires that tricycles be transformed into cleaner vehicles by stipulating the replacement of 2-stroke and even 4-stroke motorcycles with LPG or electric models. To date, nothing significant has been achieved to address issues pertaining to the tens of thousands of tricycles in Quezon City. The construction of green buildings in Quezon City cannot be mainly attributed to the ordinance but rather to owners and designers who are now much more aware of climate change and its impacts, and are progressive enough to design buildings that are environment-friendly. Of course, there are those who take to the “green” bandwagon but do nothing towards this end. Are these subject to evaluations and inspections that are the equivalent of enforcement? Now comes a bicycle ordinance from Pasig City that is formally the “Bicycle Transportation Promotion Ordinance of 2011.” It is also good and well-meaning but the jury will definitely be out there if this initiative will be a successful and sustainable one. I am quite hopeful that it would be and not just end up as an example of coming up with laws because anything about the environment is in these days. The provision in the ordinance designating bicycle lanes and requiring establishments to provide bicycle racks for parking are all good but we have seen this before in an even bigger scale in the City of Marikina. There they constructed bikeways practically connecting all parts of the city and they were quite aggressive even after foreign support had ended. Politics and shortcomings (I wouldn’t say failure.) in encouraging people to cycle have made much of the on-street bicycle lanes practically taken over by motorized transport. Bicycle racks there are also being used by motorcycles and scooters. Pasig should learn from these experiences and it is hoped that the city succeed and become another example of EST to be replicated in other Philippine cities. The lectures are to be delivered mainly by Civil Engineering and Mechanical Engineering faculty and it is quite obvious from the titles that the ME’s have focused on vehicle technologies while the CEs are into sustainable transport and design. These topics also reflect on the researches currently being implemented at the college although it is also known that IEs and EEs are doing transport-related researches including those on Intelligent Transport Systems (ITS) and logistics. Hopefully, the outputs of these researches will be beneficial to the country considering their applications to local problems.